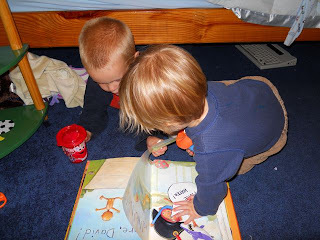 This blog, for over a year, has been largely inspired by my daughter's love of picture books. My 4-year-old son has participated in all the of birthday celebrations but he is now sparking ideas of his own with his sister off at school all day. This week's celebration started when we had just rushed back to the house from dropping my daughter off at the bus stop and we were soaking wet. This was the third day in a row of rain and I had run out of fun things to do in the house -- but there are a lot of not-fun things to do like unpack boxes, clean, and organize. I went into my son's room (with my two sons waddling behind me) and started looking through the stack of books by David Shannon that I had pulled the night before. My son asked that I read A Bad Case of Stripes and after that he asked for No, David and then David Gets in Trouble. My son realized at one point while I was reading the David books that I was adding words that were not on the page. He said, "Dad, is that on the page?" I responded, "No, I just made it up." On each spread the only words are that of David's mother telling him what to do and what not to do. David's facial expressions and body language do his talking -- no words are needed. 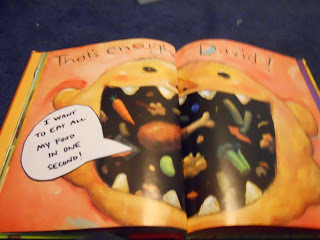 However, I wondered what my son would imagine if given the opportunity to share what he thinks David would be saying or thinking on each page. I cut a "talking bubble" out of white paper and outlined it with a black marker so it would stand out on the page. Then, we wrote down what he thought David would say. On this page, David's mother says, "No, David!" 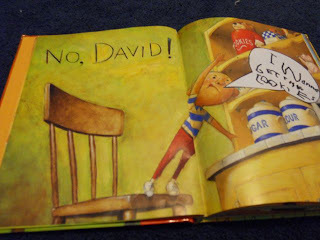 My son thought David would be saying, "I wanna get the cookies!" We taped the "talking bubble" directly in our book. If you are reading from a library book, I would try making your "talking bubbles" out of post-it/sticky notes. 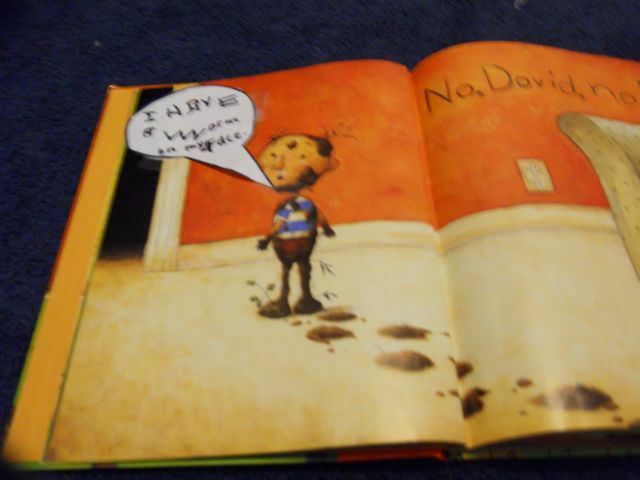 On this page, David's mother says, "No, David, No!" My son thought David would say, "I have a worm on my face." We bounced around the book and made "talking bubbles" for each page. My son got tired of writing after a while, so I wrote down his words for him. He even made a talking bubble for Fergus, the dog. In the video below from Reading Rockets, David Shannon describes the origin of No, David, a book he first made when he was a kid. 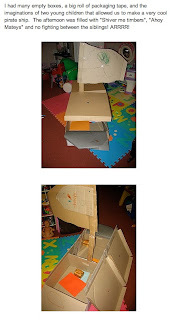 Last year, we made a pirate ship after reading Too Many Toys! Lots of great links on the blog post too! Love this idea of kids adding David's perspective! Thanks for sharing!